On the theme of drinking water, here's another organizational methodology to chew on. You've probably heard of Blue Planet Run (BPR), and if not, its a good time to check them out. BPR's mission is straightforward: Create global awareness of the world's safe drinking water and mobilize the citizens of the world to solve the problem. And they want to provide 200 million people with safe drinking water by 2027. They've definitely been doing an excellent job with their awareness campaign. They came to my attention after I saw copies of their excellent book of the same name (Blue Planet Run: The Race to Provide Safe Drinking Water for the World) on everyone's coffee table - in my doctor's office, the waiting room of a magazine company, at the airport lounge. Then I talked to Lisa Nash, their dynamic CEO, and loved another of their projects they had going on - a novel concept called the Peer Water Exchange (PWX). Every few months, members of the peer group (which can consist of anyone who wants to be involved in this decision making) review the grant applications that come in and then vote to allot money as they see fit. Think academic peer-review or open-source allocation. Makes for a transparent, participatory, and democratic process. I don't know how well its working, but it looks interesting and I would encourage more people to get involved. 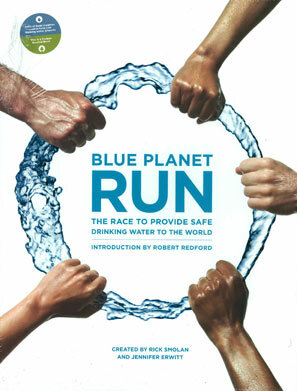 Your readers might like to know that they can download the entire $45 Blue Planet Run book for free on the Amazon order page. WoW! I had no idea...thanks for the tip Rick! !